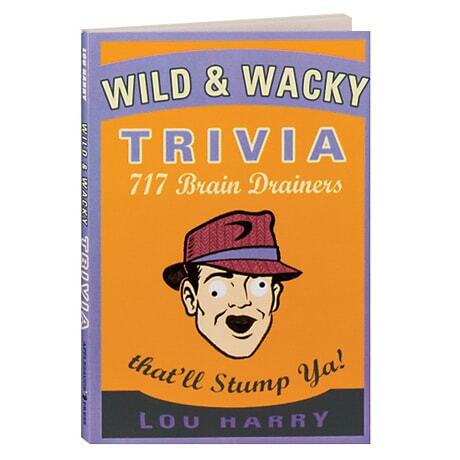 Wild & Wacky Trivia: 717 Brain Drainers that'll Stump Ya! Who was the voice of Mrs. Fox in The Fantastic Mr. Fox? Where did the Minnesota Twins play before moving to Minnesota? What is the largest island on earth? You may drive yourself wacky coming up with the answers to these and another 714 movie, food, sports, nature, games, celebrity, and Disney/Pixar trivia questions in this wildly challenging and pocketable trivia book for children 8 and up. (Just don't go for the answer pages too quickly.) These quizzes will tease your memory and spark your synapses, while hilarious cartoons and varying fonts and layouts for each entry keep the reading lively.